Chicago Mailing Tube (CMT) offers 4.000" x 24" heavy duty kraft tubes with plastic plugs. 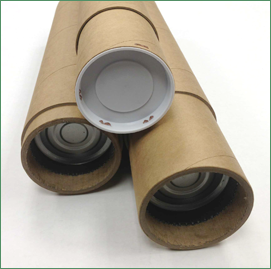 Our heavy duty mailing tubes are very durable and designed to protect your goods. Our kraft tubes include snapping end caps that lock to hold content securely. These heavy duty kraft tubes are individually manufactured with the strongest kraft material so you can be sure that your commercial products and industrial products get to their destination safely. With Chicago Mailing Tube's shipping tubes, we guarantee our caps stay secure during shipment. Chicago Mailing Tube (CMT) has a wide variety of shipping tubes and a complete series of heavy duty 24" heavy duty kraft tubes. CMT's high quality products are accessible through a tightly controlled production process. CMT's manufacturing facility operates under one roof, therefore, we are completely cost-efficient to ensure we are providing you the most affordable product. Chicago Mailing Tube is proud to an industry leaderof shipping supply companies in Chicagoland, providing eco-friendly tubes that are reusable and recyclable. We also offer 24-hours shipping services to guarantee a speedy delivery. Give us a call at (312) 243-6050 to speak to one of our service representatives about ordering your 4" x 24" heavy duty kraft tubes. No minimum order is required!